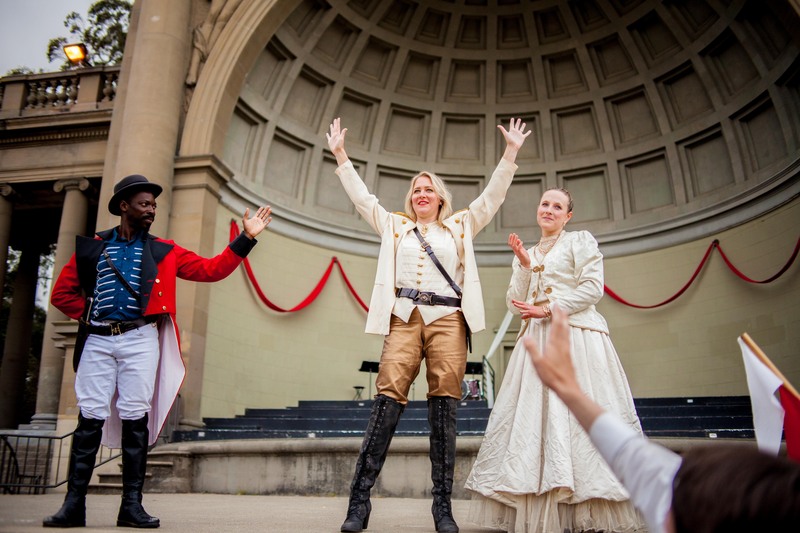 “Caesar Maximus” Strolls & Struggles in Golden Gate Park, at We Players, S.F. Among the striking Roman columns of the Music Concourse, Julius Caesar feels right at home. Ornate renaissance fountains adorned with sculptures fit right into the world of Caesar’s Rome. “Caesar Maximus”—adapted for We Players by Nick Medina from Shakespeare’s “Julius Caesar”—feels cinematic, immersed in grand architecture and stirring music. The Soothsayer (Emily Stone) guides us through the world of “Caesar Maximus,” with Libby Oberlin as the infamous Caesar. As we watch, we find that the political attitudes of imperial Rome eerily fit our current political turmoil: “Time has come ‘round. 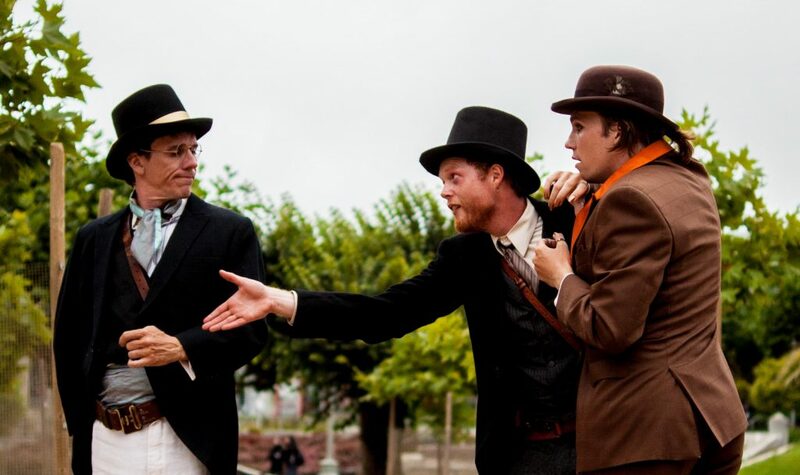 We are here.” Directed by Ava Roy, outdoors and mobile in Golden Gate Park, “Caesar Maximus” slims down Shakespeare, and sets the Roman play in a 1900 Gilded Age carnival. Because Shakespeare’s play is crammed with competitive men, director Roy has cast Caesar as a woman (powerful Lily Oberlin). Roy leaves the conspirators as men. 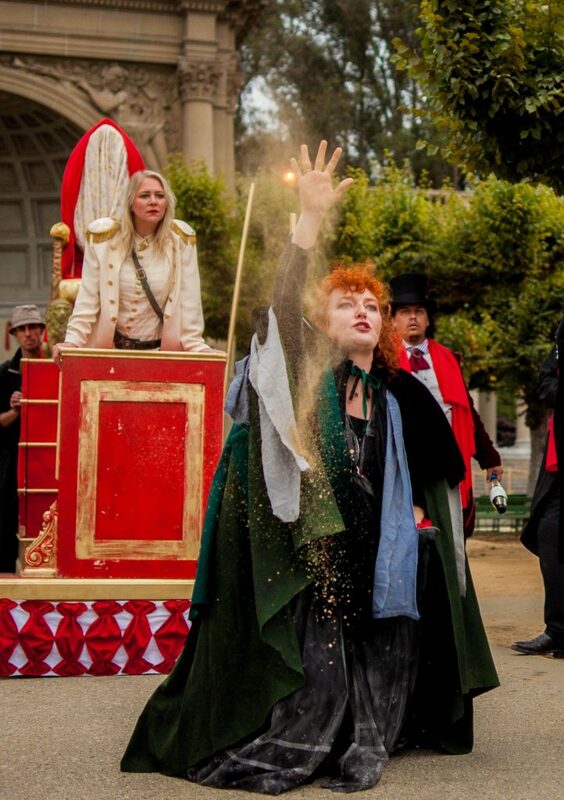 But visions of a show commenting on patriarchal power cloud over, when Caesar makes her entrance. Oberlin’s Caesar is a brash Trumpian figure, reckless in her taunts and disregarding good advice. Roy leaves little room for us to reflect on a Caesar who is already egomaniacal and obviously out of control. What or who is this meant to reflect? Caesar goes far beyond the sexist “cold and shrill” attacks on Hillary Clinton, whom We Players realize would come to our minds. Additionally, comparisons to Trump are unavoidable in any production of “Julius Caesar,” even outright purposeful. Yet it’s unclear what insight the audience gains by watching a woman stand-in for Trump. Oberlin commits wholeheartedly to the role, and her boldness is infectious. Joseph Schommer plays Brutus with a caring disposition, with rare distinction. 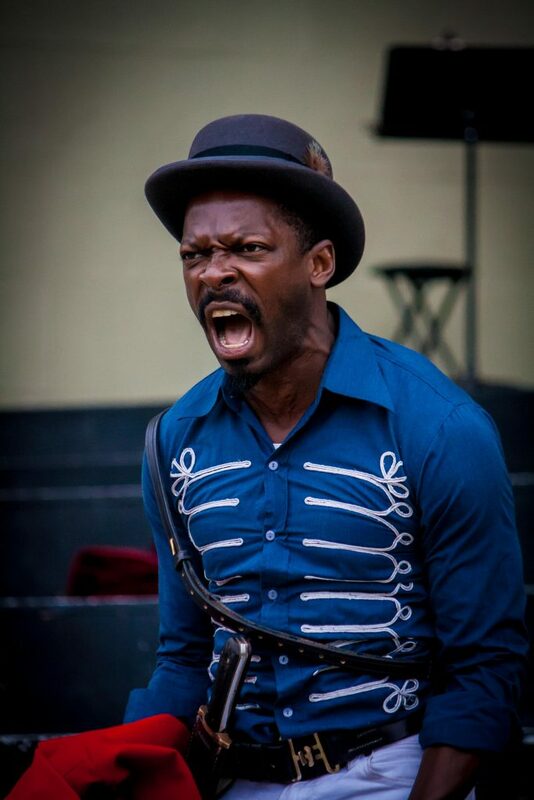 Rotimi Agbabiaka gives a beautiful performance as Mark Antony, particularly in the moments immediately after the death of Caesar, as he mourns his friend while calculating his next political move. The show struggles from some sluggish pacing in the second half. 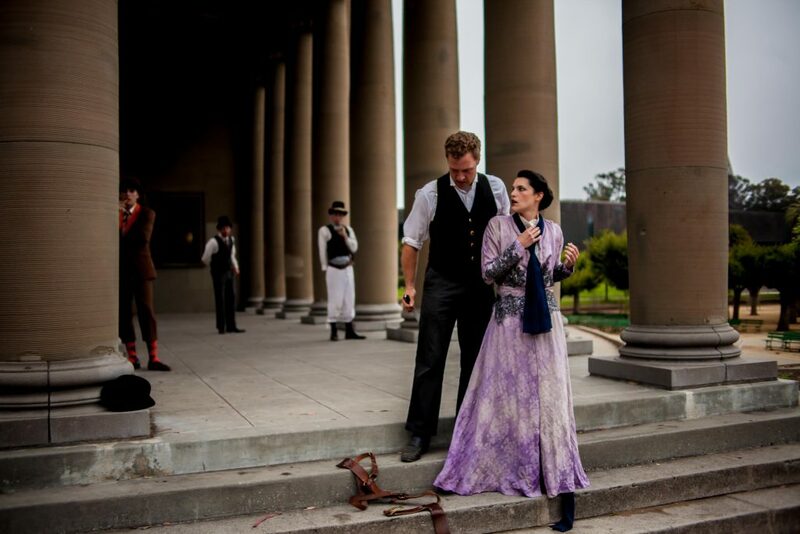 At 2 hours and 45 minutes, we spend time strolling from scene to scene, immersed with the cast. As the Soothsayer, Stone sings Italian opera to us during pauses, filling the park with song. What “Caesar Maximus” lacks in clarity, it makes up for with enthusiasm, intrigue, and atmosphere. Cast: Caesar: Libby Oberlin; Antony: Rotimi Agbabiaka; Brutus: Joseph Schommer; Cassius & Carpenter: Hunter Scott MacNair; Casca: Chris Steele; Cinna the Senator & Cobbler: Alan Coyne; Cinna the Poet: Zoltan DiBartolo; Portia: Britt Lauer; Calpurnia & Beggar: Lauren Hayes; Soothsayer: Emily Stone; and Ajax the Juggler: Oscar Velarde.